Bring your Christmas tree to life with this must-have accessory! When you flip the switch on the snowman, he plays the beginning of a well-known Christmas song – and your tree responds with synchronized music and light. 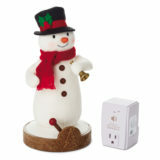 The wireless connection allows you to place the snowman up to 50 feet away from the tree.